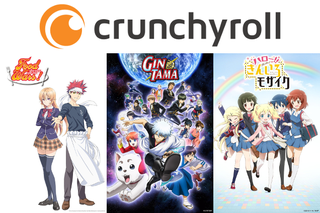 Another season has come and gone, and that means me and my compatriots at the Crunchyroll Newsletter once again listed our favorite shows of the season that aired somewhere in the world on Crunchyroll. As usual this is an aggregation of our individual lists to find our overall favorites of the season. Like always, the full article containing all of our lists can be found here. However, unlike the last two times I’ve done this, this time we actually do only have five shows! The previous times I’ve done this, there was a tie for the fifth spot between two shows, but I avoided this situation by using one of the tiebreakers I have in place. You see the fifth place show on this list doesn’t have the fifth most aggregate points, in fact it actually has one of the lowest point totals of all the shows below the fourth place spot on this list, but it does have more votes than any of the shows not in the top four, which is basically the last ditch effort tiebreaker I have in place. So with that out of the way, let’s get started! Standing up there with K-On! and Non Non Biyori as my favorite animes where nothing happens, Hello!! KINMOZA delivered the goods something fierce this season. The addition of the new teacher, Kuzehashi, who gives everyone the wrong impression with her serious mannerisms when she’s actually in love with her students leads to a ton of great moments with the whole cast. I’ll also never tire of the one-sided romance between Aya and Youko. KINMOZA was one of the more surprising series I saw in 2013, being just a genuinely feel good slice of life show. The second season continues with the show’s signature trait of being a half hour of warm and fuzzy cuteness overload. Everyone needs a nice little cool down show like this as part of their seasonal lineup. Crude and heartwarming at the same time, Gintama’s third season is quirkier than ever, constantly breaking the fourth wall and pushing both ethical and copyright boundaries to their limits. The times Gintama does take itself seriously seem more meaningful as a result, allowing its large cast to develop to the point that they can carry several episodes without the protagonist. For laughter, tears, and intriguing social commentary, don’t miss out on Gintama! Oh man, you guys remember Yakitate!! Japan? Anime about a guy making bread that was ridiculously good? Well, there is now a new contender for “Best cooking anime”, right here. Seemingly impossible challenges are constantly thrown at Soma, yet he always manages to ace them and makes whoever tastes his dishes, euhm… Well, let’s just say they really like them. He’s basically the Kenshiro of cooking, and I thoroughly appreciate every minute of it. Soma has spent his whole life under the tutelage of his father in their family restaurant, planning to one day inherit the business. So he is shocked and dismayed when his father closes the restaurant and enrolls him in a prestigious culinary school full of snooty students. However, he is also quick to recognize a chance to push himself! Partnered with a failing student, Soma nonetheless sets out to take top honors. A delicious cooking show built around real recipes! Feels good to be back into the thick of things after a season of rather silly villains and humorous episodes. The gang finally makes it to Dio’s hideout, battle it out with his personal guards and finally face the head honcho. The speaker-destroying sound of Dio using his Stand’s power (no spoilers!) always gets me giddy. Ah, JoJo’s Bizarre Adventure, where the hell have you been all my life? JoJo’s is far and away my favorite shonen battle franchise. It takes everything I love about the genre, and turns it up to 11. The Battle in Egypt part of the Stardust Crusaders arc goes even further, as things get more over the top, fun, campy, badass and yes, bizarre. As the stakes get higher, the awesome quotient of the series also increases, culminating in the long awaited clash with the man with the plan, Dio Brando. While maybe not my favorite overall arc in the series, Stardust Crusaders was still a very enjoyable experience that I will greatly miss. Now I just wait for news about the fourth JoJo’s arc. Another Kyoto Animation series involving hoards of cute girls, Sound! Euphonium portrays these girls as realistic band students rather than moe caricatures by capturing their hard work and passion for their instruments. As usual for the studio, Sound! Euphonium has high quality animation, but the series also has beautiful shots and animation sequences to immerse its audience into its world. Slice-of-life at its finest! A high school band rebuilds after self-destructing the year before, and we experience the process by following four high school freshmen as they join band and are initiated into its workings and politics. Also newly arrived, however, is their music teacher/band advisor, who institutes sweeping changes and challenges his students to prove their worth. Characters and situations both are believable and honestly portrayed, and it is this [sense of] realism that carries the show. As good as this viewing season has been, Sound! Euphonium was easily my favorite program! KyoAni has had a bit of a spotty record as of late, depending on who you ask. So I was less enthused going into this show than I usually am when starting a new KyoAni series. Needless to say I was worrying too much. Sound! Euphonium is a phenomenal show. From the animation, to the sound(the fact that they went through the effort to even record people playing badly for authenticity speaks volumes), to the characters, Sound! Euphonium shines in virtually every area. The only real cause for concern is the pacing, in that the series has massive amounts of set up, but so far very little payoff. And there you go! Did some of your favorites make the list?